I love the Beautiful Blizzard stamp set and the coordinating Blizzard Thinlits Die. It's one of those stamp sets that I initially didn't think I'd buy, but once I started to see all of the beautiful cards created by other Demonstrators I knew I had to have it. I particularly love the look of the cards with the water coloured backgrounds. I played with this bundle yesterday and wanted to share some of the amazing things you can do with it. The stamp set is perfect by itself to make a beautiful card for the holiday season. Don't you love the sentiments! You can use the Blizzard Thinlits Die to emboss a piece of cardstock using the Big Shot Embossing Mats - these mats allow you to turn in any of your favourite Framelits, Thinlits or Edgelits dies into embossing tools. I'm sure there are lots of other creative ideas. Here is a card I made using both the stamp set and cut out snowflakes. For this card I cut out snowflakes using Sparkle Glimmer paper and after stamping my card, I adhered them - layering them to give more of a 3D effect. Here's what you get when you use the die to emboss a piece of Whisper White cardstock. I haven't made a card yet with this, but I'll share it when I do. I love the fact that by using the Embossing Mats you can turn any of your dies into embossing tools! Interested in purchasing this or any of the products from the Stampin' Up Holiday or Annual Catalogue? You can shop Online or by emailing me. 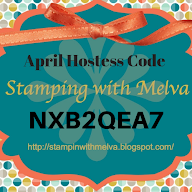 Don't forget to use the Current Hostess Code and I'll send you 4 FREE cards and instructions by mail to thank you for any $50 or more order.